In a large bowl gently combine crabmeat, mayonnaise, mustard and 2 teaspoons flour, and salt and pepper to taste. Cover and refrigerate mixture for 10 minutes. Line a plate with plastic wrap and put crab cakes on it. Cover with more wrap and refrigerate for 30 minutes or up to one day. In a shallow bowl, put extra flour for dredging. In a large skillet over medium heat, melt butter. 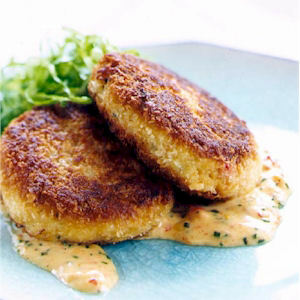 Quickly and carefully dredge crab cakes, tap off excess flour and add to skillet. Cook for 8 min. turning halfway through cooking or until golden brown. Serve with tartar sauce and lemon wedges.